Well, I’ve been intending to get some kind of nerd blog going again, and what better way than to complain about SourceForge moving to yet another issue tracking / source control solution. Don’t get me wrong. I think SourceForge is great, open source software in general is great, and that people are willing to expend resources on this sort of thing is probably a good thing all in all. This is not a problem that needed solving, and even if it did, creating a new web application was not the way of doing it. The whole writing-another-wiki-to-replace-hosted-mediawiki is particularly annoying. I vaguely remember the last time this happened just before every project’s webpage starting to look like this. Judging by SourceForge’s newfound fascination with Markdown as a formatting syntax, I think it’s got something to do with the competing site github embedding readme.md files on their project pages. Because people who write open source software really can’t handle HTML. If SF are running out of work to do, other than the kind of wheel reinvention that appears to warrant Apache incubator status, they could try bringing pageload times down from 10 seconds to something a bit more 21st century . I might even make a graph. The new Sourceforge allura markdown wiki editor. According to this this bug , all your stats are disappearing when you upgrade your project to the new, barely feature-equivalent platform. So I wrote a Java program to store those one-hits-per-month into a MySQL database somewhere, because that’s the kind of person that I am. You will probably want to change the constants defined at the top of the test class, or convert them to command-line arguments or IoC them or something. Here’s the relationship entity diagram… the SQL to create this table is in the code underneath. The projectIds will line up with each of your sourceforge projects, and the different types of statistics (cvs or svn upload and download) each have their own statType. Since this is a daily summary, the combination of projectId, date and statType should be unique. If you were really keen you could set up foreign keys into as-yet-unimplemented project and statType tables, but hopefully you get the idea. /** Retrieve sourceforge statistics and store them in a database. *   associated with it, which may cause primary key violations on subsequent updates. * a given calendar range. One request will be made per month. * using a given calendar range. One request will be made per month. 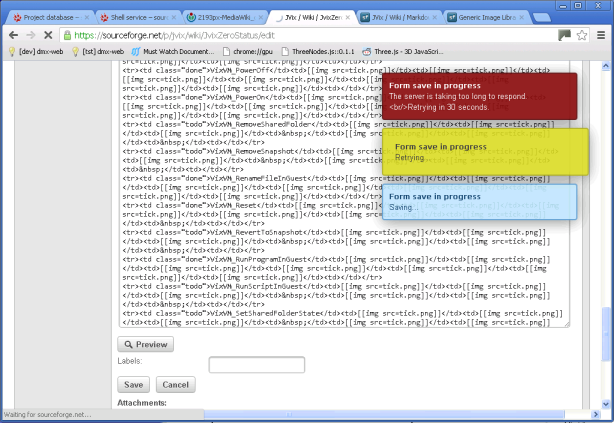 /** Test the SourceforgeStats retrieval class. There are a couple of other com.randomnoun.common. * classes referenced above which I will put up here in due course, but you could probably comment them out for the time being. I am aware that you could write this in one line of perl. Apologies for how hideous that button looks. I’m currently trying different styles as to how to represent these sorts of things. Graphic design is not my strong suit. Update 24/9/2013: It’s in central now. Update 28/9/2012: Tried to sound slightly less whiny about SourceForge’s development practices. Update 1/10/2012: Added a screenshot showing the popups that appear whilst saving a page in SourceForge’s new wiki editor. Update 17/10/2012: Added an entity relationship diagram.